Everyone has heard the terms “lawyer” and “attorney,” and most people probably have a vague idea what attorneys are supposed to look like or how they are supposed to act based on some courtroom drama they’ve seen, whether it was Perry Mason, LA Law, Matlock, or Law & Order. But there are a fair number of people who don’t really understand what a lawyer does. Other than trials—which make up the vast majority of attorney activity on television—what do attorneys do? The question is simple, but the answer is far from it. Broadly speaking, a lawyer is someone who is familiar with the law and is licensed to help someone else achieve some legal end. Transactional lawyers may help two businesses reach an agreement that tries to anticipate all eventualities, address them in a way that is agreeable to both parties, and in a form that will be enforceable if one party doesn’t comply. The businesses alone would not be very well equipped to draft their own contract because they are not familiar with the contract laws in their jurisdiction. For example, they may not realize that if the party with superior bargaining power makes the contract too one-sided, it could be void for unconscionability. Estate planning attorneys understand intestate succession laws work (the rules that determine how the property of the deceased is passed on when there is no will) and can help draft a trust, which is a legal vehicle that allows the heirs of the deceased to bypass courts altogether (called probate). Family law attorneys know the laws regarding adoption, divorce, child custody, and child support and can help with property division during a divorce, help get a protective order against an abusive spouse, or draft prenuptial agreements that will withstand judicial scrutiny, among many other things. Litigators are those attorneys who make use of the courts to right legal wrongs that are not criminal in nature—usually either based in contract (binding agreements) or torts (civil wrongs). For every civil claim a party makes in court, there is a set of elements that the plaintiff must prove to prevail. For example, in car accident cases, attorneys will use theories of negligence, among other things. And for a plaintiff to prevail in a negligence case, he or she must prove that the defendant owed a duty, breached that duty, and that the defendant’s breach was the actual and legal cause of damages (loss) incurred by the plaintiff. A civil litigator understands the substantive rules (like what needs to be proven to win) and the procedural rules (rules governing litigation, like knowing in which court to file, what the filing deadlines are, what a court filing should look like, page limits, format for legal citation, rules governing expert witnesses, minimum allegations in a pleading, etc.). There are many many other kinds of attorneys, but they all have one thing in common—they have a license that allows them to help people achieve some objective that cannot be achieved without going through some legal process. And although individuals (not businesses) can represent themselves without an attorney, having a good attorney can be well worth the cost because attorneys can navigate through the complexity of the law without unduly jeopardizing your case and maximize your chances of achieving your objective. And for some cases, like car accidents, many attorneys are willing to work for the promise of payment from the opposing party—so you never have to come out of pocket. Having a good attorney is invaluable when you have a legal need. 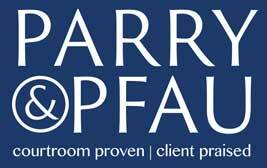 Give the attorneys at Parry & Pfau a call and find out why our clients love us.